Aroma L & ULTIMATE BAHAMUT 30 mlPeach and kiwi mixed in a delicious mint tea.Content: 30ml. Aroma A & L ULTIMATE ONI 30 ml One of the best citrus aromas of the moment. A masterful combination of lemon lime with a refreshing touch that makes it unique. 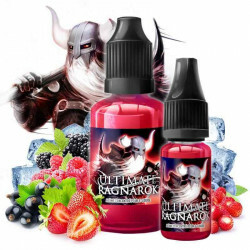 Aroma L & ULTIMATE RAGNAROK 30 ml The new fragrance Ultimate Ragnarok 30ML, is a refreshing mix of red and wild fruits, raspberries, blueberries, strawberries, blackberries, etc., in a whirlwind of Frecor. Content: 30ml.